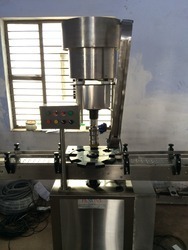 Leading Manufacturer of eye drop capping machine, automatic inner capping machine, automatic screw capping machine, aluminum capping machine, automatic aluminum capping machine and automatic bottle capping machine from Ahmedabad. 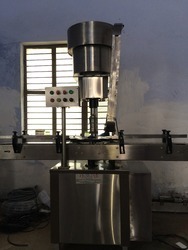 Keeping in mind the diverse requirements of the clients, we manufacture, supply and export an extensive array of Eye Drop Capping Machine that are acclaimed among the clients for durable standards and easy maintenance. These products are functionally efficient in nature and are as per the set quality standards and guidelines. Moreover, we offer them at most reasonable rates. 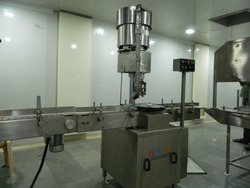 Suitable for eye-drop bottle, cosmetic, pharmaceutical chemical liquid etc filing, plugging and over-capping operations. Adopt single axle adjusting piston, the request filling volume can be adjusted quickly and precisely. The part of piston which contacts with the liquid is made of fine ceramics. Can avoid the contamination and meet the GMP standard. 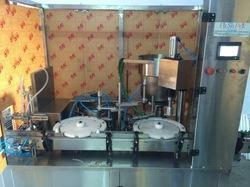 Automatic feeding bottle, positioning and operation are controlled automatically. 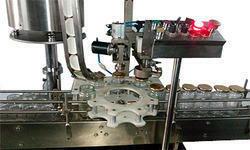 The automatic capping is designed according to the sealing mouth of screw cap. The fastening (sealing) range can be adjusted according to the material of cap. With safety device, machine will stop automatically when bottle fell down or not in correct position during use the hand-wheel. When specification of the bottle is changed. It only needs to change starwheel. The height can be adjusted also. It is very easy to wash & clean. Adopt stepless speed variation motor, the operation speed can be adjusted freely. It can be run individual or connected with automatic labelling machine and automatic cartoning machine to complete the whole line running in one line production. 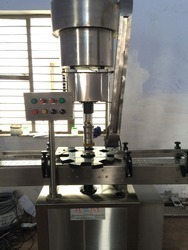 The Monoblock machine is designed for automatic filling, inner plugging and over-capping onto small containers, most suitable for eye-drop and small volume injection liquid production to meet with GMP standards. Speed 35 - 70- bottles/min. 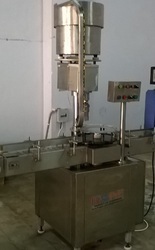 Owing to the expertise of our team of experienced professionals, we are able to introduce an exclusive range of Automatic Inner Capping Machine. The offered machine has stainless steel elegantly matt finished body along with single motor synchronizes conveyor, star wheel, and platform turret. 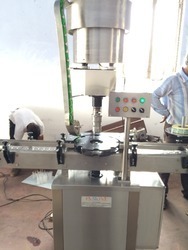 In addition, the machine has adjustable height of conveyor belt, to align with other machine of the line. 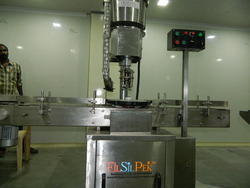 Besides, clients can get the machine from us at industry leading rates. CAP DIA : 22 mm, 25 mm, 28 mm AND 38 mm. 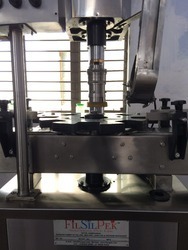 As a trust worthy organization of this domain, we are committed to offer our clients a superior quality assortment of Automatic Screw Capping Machine. The offered machine self-lubricating UHMW-PE guide profile for low friction wears surface, smooth and noiseless conveying. · Also, the stainless steel cladding or hard chrome plating of all exposed parts to ensure long life and resistance against corrosion. This machine is synchronized A/C drives to synchronize, conveyor, star wheel and platform turret and capping bowl. 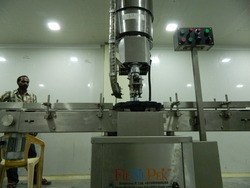 Besides, clients can get the machine from us at industry leading rates. Features: Low maintenance Easy operation Optimum performance Other Details: No container No cap arrangement SS elegantly matt finished body Single motor synchronizes conveyor, star wheel, & platform turret Adjustable height of conveyor belt, to align with other machine of the line Sealing pressure can be varied to suit different gauges and size of caps Low noise level, low power consumptions Self-lubricating UHMW-PE guide profile for low friction wears surface, smooth and noiseless conveying SS cladding or hard chrome plating of all exposed parts to ensure long life and resistance against corrosion Synchronized A/C drives to synchronize, Conveyor, Star wheel and Platform turret & capping bowl Adjustable bottle height gauge for easy and quick setting Electrical supply 1 Phase + Neutral + Earthling Electrical load 0.75 KW Specifications: Model SC-A4H OUTPUT 40 TO 60 BOTT / MIN POWER CHARACTERISTICS 440 VOLTS, 3 PHASE MACHINE DIRECTION LEFT TO RIGHT. INPUT SPECIFICATIONS CONTAINER DIA 22 TO 65 mm CONTAINER HEIGHT 38 TO 120 mm CAP DIA : 22 mm, 25 mm, 28 mm AND 38 mm. Height Of Conveyor 750 mm to 840 mm. Motor	1HP/440 Volts/50 Hz 1.5 HP/440V/50 Hz. 1.5 HP/440 Volts/50 Hz. Height Of Conveyor	750 mm to 840 mm. High sealing speed, suitable for volume-produce Convenient for use, good sealing quality, work continuously Ejection plastic iron housing. 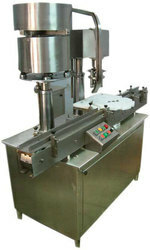 Available in user friendly features, we offer Automatic Cap Sealing Machine, which is priced at industry leading rates. 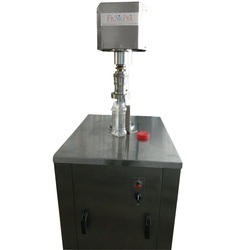 Application : This machine is used in industries like Food,Beverage,Medical etc. 1HP/440 Volts/50 Hz 1.5 HP/440V/50 Hz. 1.5 HP/440 Volts/50 Hz. 750 mm to 840 mm. Motor 1 HP / 440 Volts / 50 Hz 1.5 HP / 440V / 50 Hz. 1.5 HP / 440 Volts / 50 Hz. 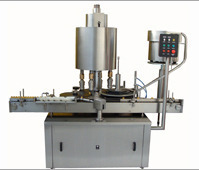 As an affluent name of this domain, we hold expertise in presenting high quality Automatic Sealing Machine. 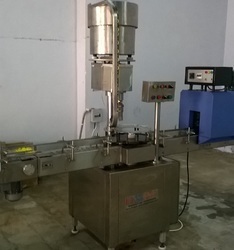 This machine is used in packing tea, herbs, coffee, tea-bags, beverages and other drinks. The capacity of the machine is forty to sixty pouches per minute. In order to provide such huge capacity, our professionals used advanced technology and techniques adhering to industry guidelines. 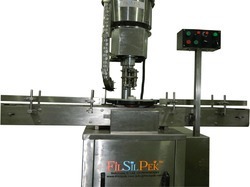 Also, clients can get custom specified machine from us according to their business requirements. POWER CHARACTERISTICS 440 VOLTS, 3 PHASE ( 4 wire system ), 50 Hz. Capper is a Roll Over Pilfer Proof capper designed to thread and seal aluminum caps onto rigid containers. The capping heads can be adjusted for an assortment of container shapes, diameters, and heights. Designer beverages or champagne bottles are good examples of containers with closures. 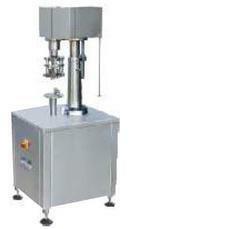 capper is widely use for Liquor, Medical, Pharmaceuticals, Beverages, Food, Agrochemicals, Edible oil, Lube oil and misc. industries. Heads with low tension springs can be fitted to seal PET / PVC / HDPE bottle. Capping heads can be adjusted for any shape and sizes bottles. Capping heads with two threading and two sealing rollers for different diameters and heights (standard semi-deep drawn, deep drawn, extra deep drawn) of caps. 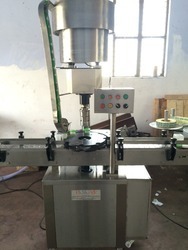 Since our commencement, our firm is engaged to introduce a premium quality array of Semi Automatic Capping Machine. ROPP capper is widely use for Liquor, Medical, Pharmaceuticals, Beverages, Food, Agrochemicals, Edible oil, Lube oil and misc. industries. Heads with low tension springs can be fitted to seal PET / PVC / HDPE bottle. Capping heads can be adjusted for any shape and sizes bottles. Capping heads with two threading and two sealing rollers for different diameters and heights (standard semi-deep drawn, deep drawn, extra deep drawn) of caps. Capper is a Roll Over Pilfer Proof capper designed to Screw caps onto rigid containers. The capping heads can be adjusted for an assortment of container shapes, diameters, and heights. Designer beverages or champagne bottles are good examples of containers with closures. Capper is a Roll Over Pilfer Proof capper designed to thread and seal aluminum caps onto rigid containers. The capping heads can be adjusted for an assortment of container shapes, diameters, and heights. Designer beverages or bottles are good examples of containers with closures.